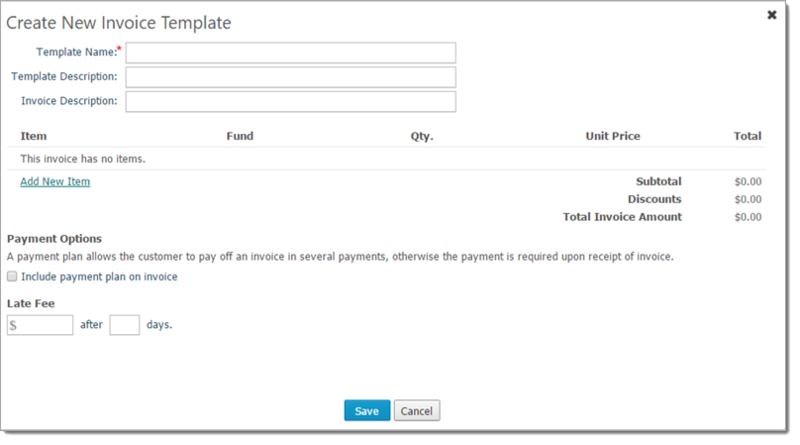 Invoice templates can be used as a starting point for a creating a new tuition invoice. They offer you a quick way to create invoices for multiple customers whose invoices contain the same line items. When you create a template and then save it for re-use, you eliminate the need to enter the same information every time you create a new invoice. When you need to create a new invoice, simply select the template you want to associate it with and start from there. Click Template to display the Templates page. This page lists all of the templates you previously created. Each template entry shows a descriptive name for the template, the date the template was created, and the date it was last modified. This button is available only if you are a user with View + Add/Edit permissions. An asterisk (*) indicates required information. Although the Invoice Description field is optional, adding information in this field is required when you create the actual invoice. To save time, you can enter the description here. Template Name: the name of the template. Template Description: description of the template. Invoice Description: description of the invoice. To add an item, you must have a record created for the item. For instructions, go to How to Add an Invoice Item. Click the Add New Item link. In the Item dropdown list, click to view a list of all available invoice items. Select the item you want to add from the list. The item is added to the template. You see the fund associated with the item and the item's unit price. If desired, change the quantity by updating the value in the Qty field. The software updates the total amount based on each new invoice item you add and any changes you make to the quantity. If you want to include a payment plan on the invoice, do the following: Note: A payment plan allows the customer to pay the invoice in installments rather than in one lump sum. Select this checkbox: Include payment plan on invoice. Enter the details of the payment plan into the displayed fields. The software calculates the number of payments and installment amounts based on the details you provide. If you want to specify a late fee for overdue invoices, enter the amount of the late fee and the number of days past the due date that the late fee will be applied. Click Save to save the template. The system displays a message to inform you that the template was successfully created. Click Close. You return to the Templates page. The template you created now appears in the list.